Garden, Pantry, Pool, Walk-In Closets. Kitchen/Dining Combo, Living Room, Living/Dining Combo, Storage Room, Study, Utility Room. Landscape, Open View, Panoramic, Scenic View, View. 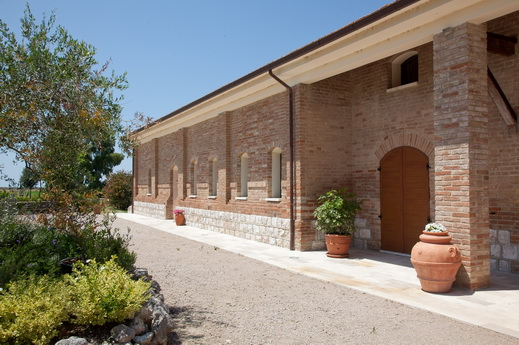 Location In the heart of the Natural Park of Maremma, just 6 km from Grosseto and 9 km from the sea, we find the Tenuta in Maremma, consisting of a large, perfectly restored farmhouse, two annexes used as a storage room and a garage, a large garden with a swimming pool and 39 hectares of excellent arable land. The landscape is remarkable, characterized by steep and rugged hinterland areas, with hills that descend to the sea, through pine forests, pastures and farmlands, reaching sandy beaches and cliffs. 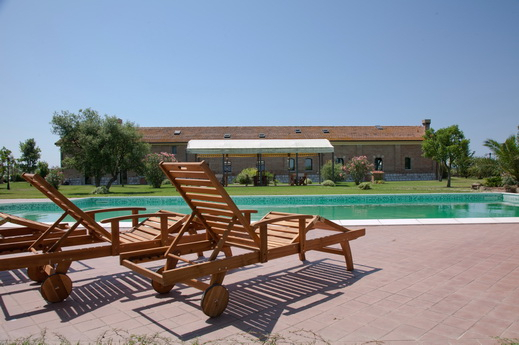 Principina al Mare (9 km) and Marina di Grosseto (11 km) are less than 10 minutes away by car. 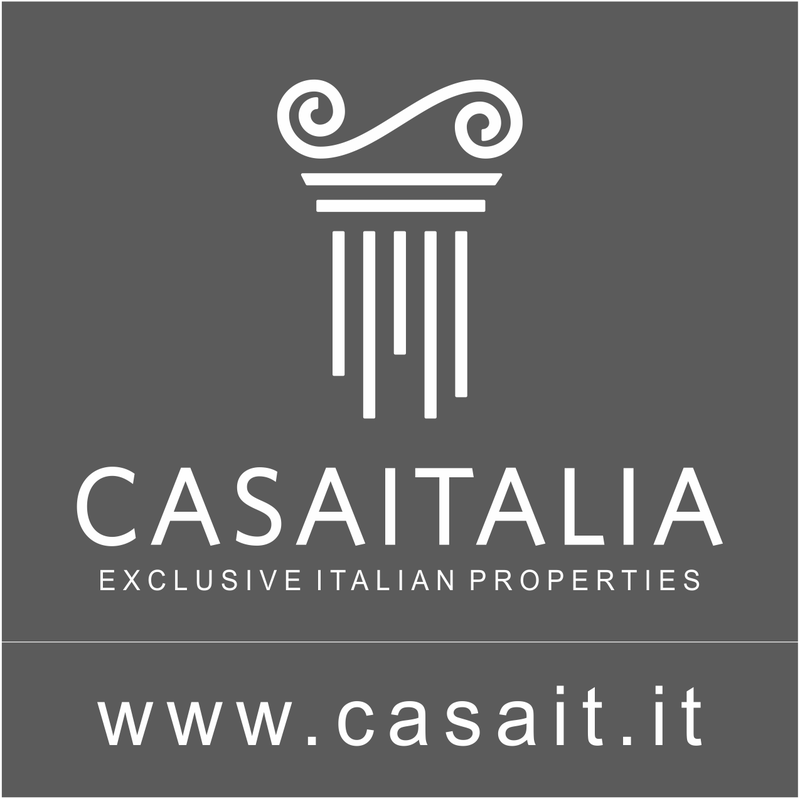 In a few minutes more you can get to Castiglione della Pescaia (21 km) and Talamone (32 km), while other very famous coastal resorts in the area, like Punta Ala (42 km), Follonica (40 km) and Monte Argentario (43 km) can be reached in about half an hour. 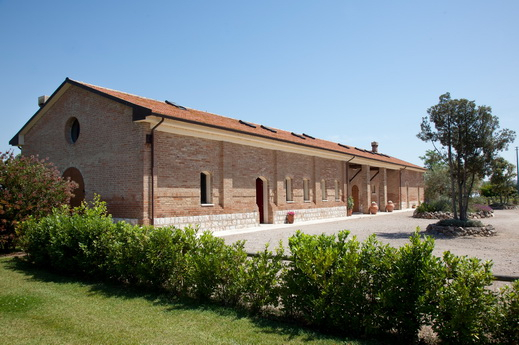 Description of buildings Tenuta in Maremma consists of a large farmhouse with a gross floor area of 637 sqm, spread over two levels and divided in two large apartments, which are completely separate. Apartment 1 The entrance leads directly into the large living/dining room, in which there is a central fireplace and which leaves you pleasantly surprised by the large dimensions of the room (with exposed ceilings made of white wood and over 4 m high) and by the numerous French windows that look out onto the garden. To the side, there is a kitchen with a pantry. 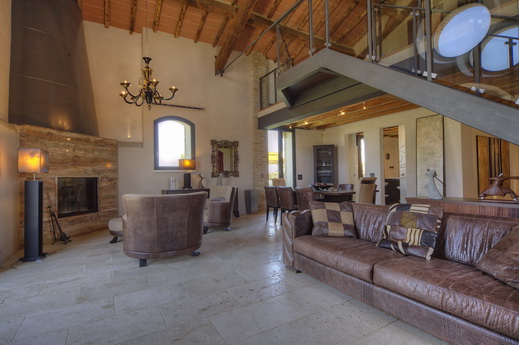 On the ground floor, opposite the living room, there are also two double bedrooms and a bathroom. 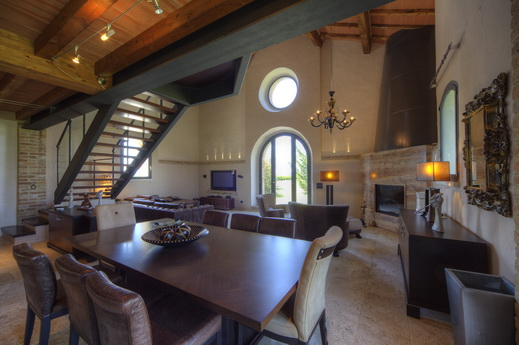 A beautiful decorative staircase with large stone steps embedded in the wall leads to the upper floor, which consists of two large bedrooms, a study/lounge, completely overlooking the living room, and a bathroom. Apartment 2 The heart of this apartment is also living/dining room, again over 4 m high and with beamed ceilings, this time in their natural colour, as well as large windows. 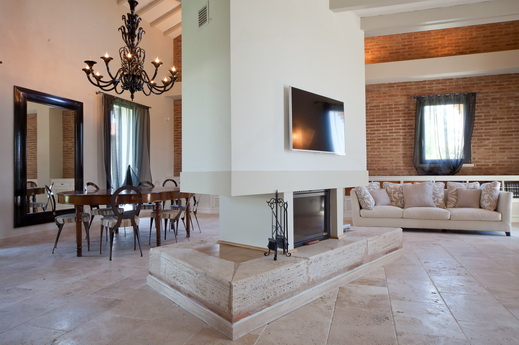 The living area has, in addition to the dining area, large sofas and armchairs that face a stone fireplace and a billiard table. The kitchen is large and has a pantry in the back. If necessary it can be closed by a double sliding glass door. 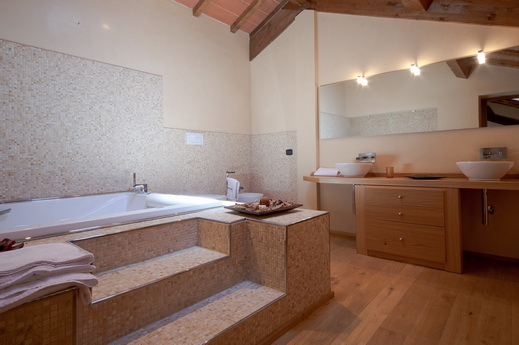 On the ground floor, there are also two bedrooms and a bathroom. 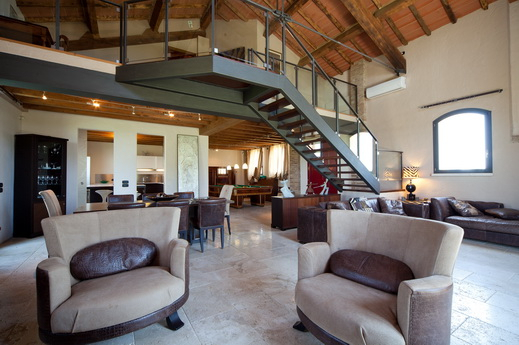 The upper floor can be reached via a staircase made of wood and exposed steel that leads to a large hallway/lounge overlooking the living room below. 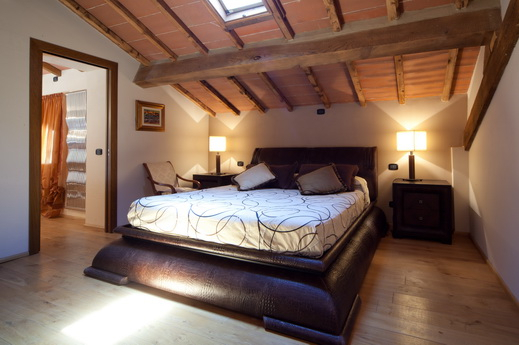 Following on, there is the sleeping area, consisting of the master bedroom with an en-suite bathroom, a wardrobe, another two bedrooms and a bathroom. 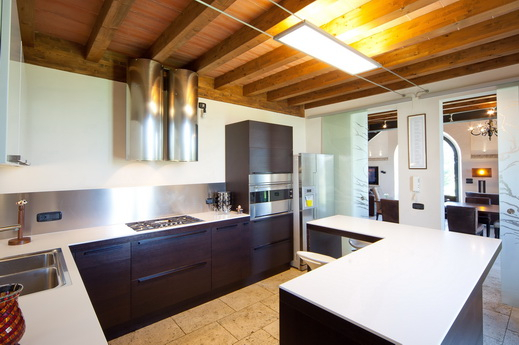 The property also has an annexe, used as a storage room and a garage, with a gross floor area of 274 sqm, as well as a storehouse of 55 sqm. 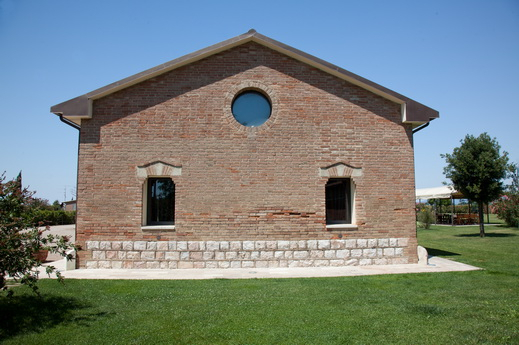 Energy efficiency class: G. EPI: >127 Condition The farmhouse is in perfect condition. 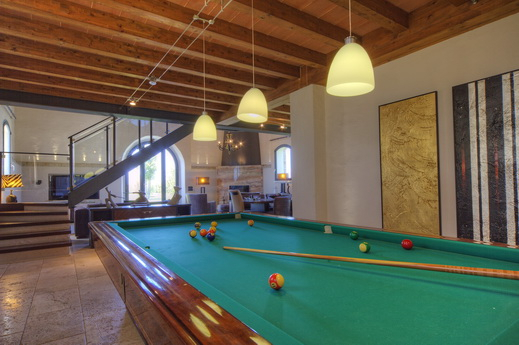 It has been recently renovated with high quality materials and finishes and is divided into two large homes, almost equal in size, with pale stone floors in the living area and parquet floors in the sleeping area. They differ in the colour of their ceilings (apartment 1 has white ceilings and apartment 2 has ceilings in natural wood). 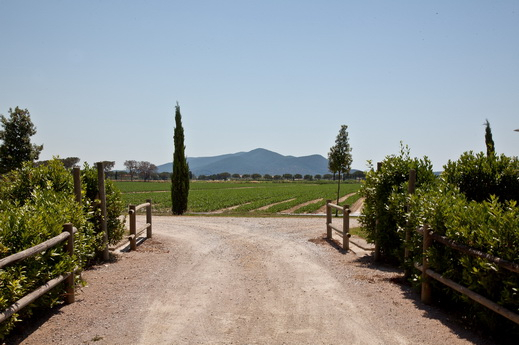 Outdoor space Tenuta in Maremma is surrounded by 39 hectares of arable land of excellent quality; the area around the buildings is kept as a lawn and is bordered by hedges and a fence. 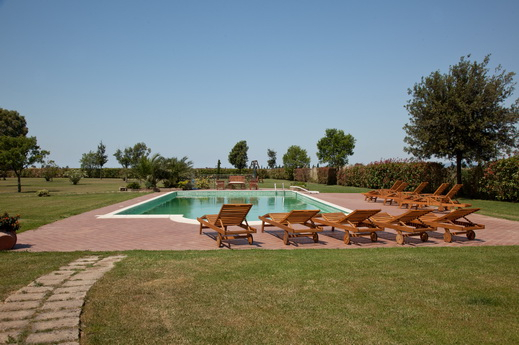 On the opposite side, with respect to the entrance to the property, a swimming pool with a sun terrace has been built. 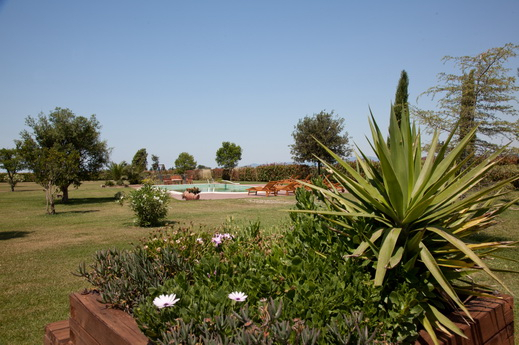 Usage and potential Thanks to its position, in open countryside, but at the same time close to a medium-sized town like Grosseto (6 km) and to the Tyrrhenian Sea (9 km), the Tenuta in Maremma is ideal both as a main residence for one or two families and as a holiday home, with the possibility of pursuing the agricultural activity and also combining it with tourist accommodation.